A pet peeve for many when watching a movie in a theater is when people start talking. 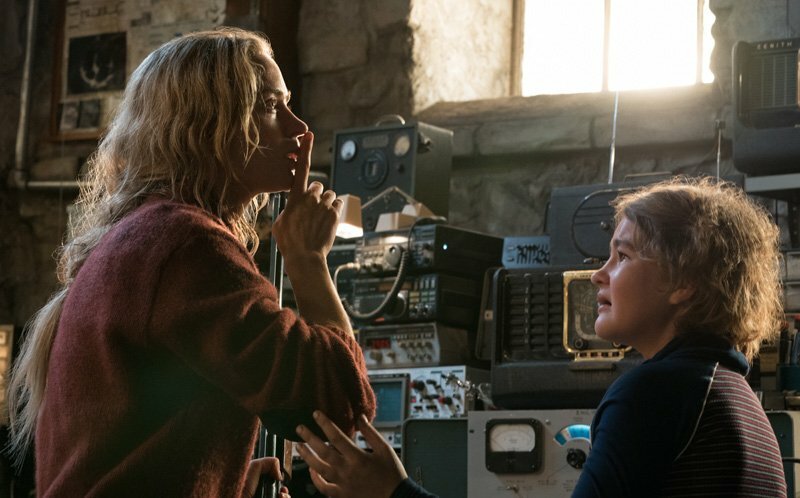 A post to promote A Quiet Place shows off some of the positive praise the movie received so far and gives a subtle hint of what to do when watching the film. The official Instagram account for A Quiet Place made a post on Thursday with single-word quotes from four reviews of the film: “Scary,” “Thrilling,” “Fantastic,” and “Unrelenting.” Then to make a secondary point, the letters S-T-F-U are highlighted. This acts as both a reminder of how the characters in the movie have to stay quiet and also what to do when watching the movie in a theater. Scary. Thrilling. Fantastic. Unrelenting. Warning: don’t make a sound. Get tickets for #AQuietPlace, in theatres April 6. A Quiet Place stars the husband and wife team of John Krasinski and Emily Blunt, with Krasinksi also directing the film. In the movie, Evelyn (Blunt) and Lee Abbott (Krasinski) try to live their lives and protect their two children in a world where deadly creatures hunt down anyone that makes a noise. Early reviews of the movie poured on the praise, giving A Quiet Place a 100 percent Certified Fresh rating based on 35 reviews on Rotten Tomatoes. It’s a difficult task to hold a perfect rating with so many reviews, but Black Panther kept the same perfect rating with 43 movie reviews prior to its release. Paramount Picture’s A Quiet Place starring Emily Blunt and John Krasinski opens in theaters on April 6. The movie marks the second time the married couple appeared in a film as husband and wife. Both played the lead roles in 2017’s Animal Crackers. They also made cameos in The Muppets in 2011. On Friday, Blunt was a guest on The Late Show with Stephen Colbert and talked about how she wasn’t initially on board for the film, but changed her mind after reading Krasinski’s script. She also described a scene in the film that unsettled members of the film crew.